I don’t know what’s been up with Zack Snyder as of late, but the guy sure has been enjoying sharing all kinds of interesting trivia pertaining to Batman V Superman: Dawn of Justice in recent memory. Sometimes, he may provide answers regarding things that have puzzled moviegoers for the past couple years, or he may declassify some cool pictures. Either way, he’s doing a fine job of keeping DC fans engaged. And while it’s not Snyder who we have to thank for the topic of today’s discussion, it’s still interesting to see, regardless. 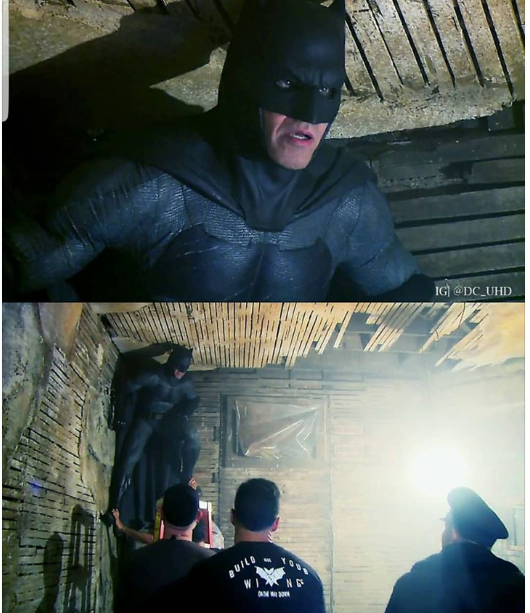 Having originally surfaced over on Instagram before making their way to Reddit, these images stacked on top of each other take us back to BvS‘ infamous branding scene, which caused some consternation insofar that a percentage of moviegoers found this take on the Dark Knight to be too violent. As you can see, it appears to be a stuntman perched in the corner of the basement, for his chin differs from Affleck’s recognizable jaw. And although I somewhat agree with those who thought the branding was going too far, I did like how this scene framed Batman as a force of nature and a borderline mythical creature. Plus, some tribute was paid to Frank Miller’s classic work, The Dark Knight Returns, which we know had a strong influence on the film as a whole. Still, this wasn’t my favorite showcasing of the Caped Crusader in the flick, as I happen to be a huge fan of the warehouse fight. To me, that was something I’d been clamoring to see in a live action movie for ages, as Bruce engaged in what appeared to be more comparable to fist fights in past outings. But in Batman V Superman: Dawn of Justice, we were treated to something more in line with what’d go down in an Arkham game, and it was glorious to behold.